Black sclera with a blue sun corona behind the pupil. Suits all manner of alien and magic themes. 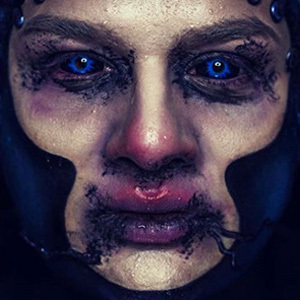 These black and blue contact lenses are perfect as a finishing touch of alien or sea creature costumes. The black outer part of the lens covers the white part of your eyes while the blue irregular star shaped area surrounds your pupil. ColourVue Sclera Thanos 22mm contact lenses provide an interesting look, which isn't as gory as with the other sclera contacts, and therefore can be used in much more types of costumes.